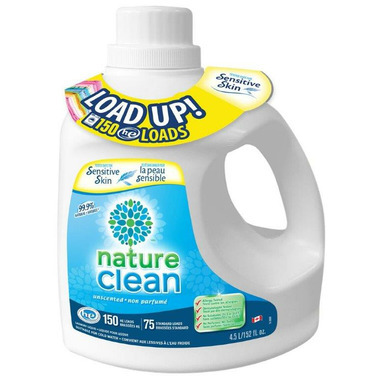 Nature Clean's hypoallergenic Laundry Liquid will help you get your family’s clothes nice and clean naturally without using any optical brighteners or other harmful, toxic chemicals. This foaming formula is vegetable based, derived from corn and palm kernel oil. It’s safe for infant clothing and great for High Efficiency top and front loading machines. I use it because it doesn't irritate my sensitive skin. I adore an odourless product, and one that I'm not allergic too. It's the only detergent I've found that works for me. And now it's in bulk! We are pretty thrilled. Good product! Gets clothes clean but doesn't take out difficult stains which is why I gave 4 stars rather than 5, otherwise great product.